With Kelly Girtz preparing to start his first term as mayor of Athens-Clarke County, the city is planning to make a more dedicated effort to solve fair housing issues. In 2016, a study done by APD Solutions Consulting concluded that the city is not building enough affordable homes for single families. According to the study, this has caused individuals on moderate income levels to leave Athens and live in surrounding areas, which also impacts traffic coming into the city. “The results were released over three years ago, and nothing has been done to follow up on that study,” Athens-Clarke County Commissioner Melissa Link said. Girtz’s new plan could be a step in that direction. Why it’s Newsworthy: If Girtz’s plan is successful, Athens would have more affordable housing options for people with low- to moderate-incomes. Additionally, people moving back could aid in the traffic issues that are exacerbated by the Athens workforce living outside the city. Girtz’s new plan addresses these issues in two parts: finances and code. The financial part of the plan is broken up even further between an upcoming SPLOST package and the addition to tax allocation districts. “What I’ve suggested is somewhere in the $3-4 million range a year should go to affordable housing support, and that could be for everything from land acquisition to paying for some of the underlying infrastructure,” Girtz said. The SPLOST package will need to be voted on by citizens of Athens-Clarke County before it can be implemented. Controversy surrounded the last SPLOST package that was voted on in Athens-Clarke County, a TSPLOST package voted on last year. The package did pass, but not without plenty of discussions through open forums. The tax allocation district could serve as an incentive for developers. In the district, any tax dollars that are generated in a defined period of time in the future would be directed right back at that land instead of being dispersed throughout the county. According to Girtz, this would make the area more attractive and cheaper to develop. Girtz’s plan also includes an incentive in the code section: a density bonus. With this, the city would collaborate with developers, urging them to include more affordable properties in an area of land. “We’d underwrite some of the cost of development, proportionate to the number of affordable units that are in new development,” Girtz said. There are organizations in Athens that are currently working to make more affordable housing options for low- to moderate-income homeowners. One such organization is Athens Land Trust, which develops homes to be sold and then leases the land to the homeowners for 99 years. This way, the owners can change the house however they want, but the Land Trust retains ownership of the property. Normally, Athens Land Trust targets locations that have title issues or have been specifically suggested by someone, so there is not always a lot of competition with investors looking around Athens for projects. There is still crossing of paths, however. “It sometimes makes it difficult when they’re flipping near where we’re working, because it can drive up property costs,” Heather Benham, executive director for Athens Land Trust, said. Groups like Athens Land Trust would also benefit from Girtz’s new plan, as they draw funding from the city. 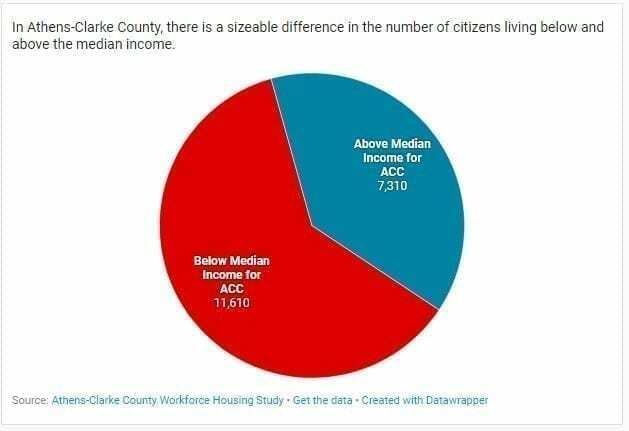 One of the biggest issues with affordable housing in Athens-Clarke County is properties that have been termed “investment properties.” These are properties that investors have purchased to fix them up and then either rent out or flip for a profit. These properties, Link argues, are further pushing homeowners away from Athens because the higher rents are becoming unaffordable for citizens living below the median income of $32,715. “You’ve got mostly older homeowners who are used to living quiet lives, and you get rowdy students living next to them, and it’s not pleasant to live there, and it further incentivizes them to sell out,” she said. When Girtz takes office in January, he said that he would start working to move forward with this plan immediately. Benjamin Tankersley is a senior majoring in journalism at the Grady College of Journalism and Mass Communication at the University of Georgia.